Following on from Jubilee Hall Trust’s Outstanding Achievement award on 30th November, the charity was honoured again just two days later when Chairman, Steve Cabrera, was recognised for his service! The annual Active Westminster Awards took place at the prestigious Lord’s cricket ground on Friday 2nd December and were hosted by Sky Sports presenter, David Garrido. The awards are a celebration of the great work carried out in the City by a wide range of organisations and individuals. Steve Cabrera was nominated in the Active Volunteer category for his 11 years service as a Trustee, including ten as Chairman. Over that time, Steve has given up countless hours to drive the charity forward and his passion and enthusiasm combined with his expert business management knowledge and personal commitment, made him the ideal leader for the charity. He was responsible for leading a change in focus of the charity towards building healthier communities, and he instigated a re-brand in 2010, and then ensured that the Board of Trustees were aligned with the executive team. He also forged a partnership with St Clement Danes school to provide them with free physical activity sessions, and was instrumental in bringing the Big Dance Bus to Covent Garden, after a chance encounter with someone from the Mayor of London’s office. The charity have since sponsored the Bus to come to the Piazza in 2012, 2014 and 2016, bringing inspirational dancers from the English National Ballet and other professional companies, and giving thousands of local children and community groups the opportunity to perform on our stage. During the London 2012 Olympic Games, he agreed a partnership with the US National Basketball Association to transform Jubilee Hall into the ‘NBA House’ creating a unique basketball experience in central London. Steve is also a strong believer in creating and sustaining great teams and, as well as being an Investors in People company, the charity became, in 2014, a London Living Wage employer, one of very few in the leisure industry. 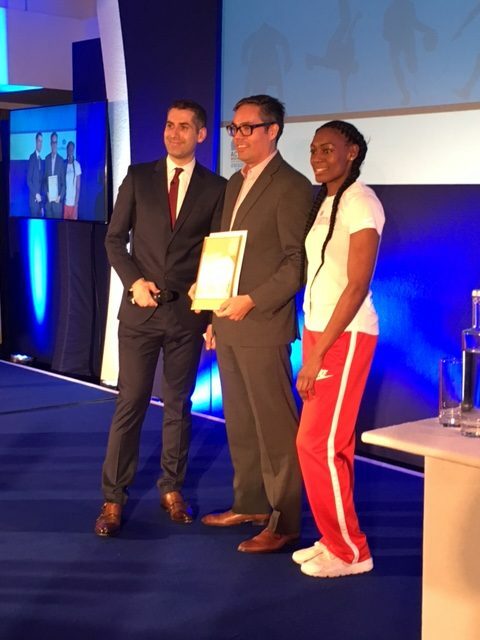 Steve received his award on the night from Olympic 400m runner Perri Shakes-Drayton.